It's not a major shock, but Danny Knobler of CBSSports.com (via Twitter) hears that the Phillies still aren't looking to sell. That's sure to be a disappointment to teams like the Yankees and Red Sox, who have interest in dealing for Michael Young. Of course, the Phillies have other veterans who would be of use to rival clubs, including Chase Utley, Cliff Lee, and Jonathan Papelbon, but they'll likely hang on to them as they look to make something happen in 2013. Here's more out of the NL East..
Mike Adams has been officially ruled out for 2013 and will likely miss part of 2014 as doctors have declared that he will require surgery for multiple tears in his shoulder, writes Matt Gelb of the Philadelphia Inquirer. Adams, who is owed $7MM next season, was thought to be a trade candidate this time a month ago if the Phillies decided to sell at the deadline. If the Phillies have a change of heart and wind up moving Young, third base prospect Cody Asche could wind up filling his shoes at the big league level, write Bob Brookover, Gelb, and Marc Narducci of the Philadelphia Inquirer. Delmon Young cashed in on a $100K bonus this week as it was his 80th day on the active roster and he'll make another $150K with another 18 plate appearances, notes Matt Gelb of the Philadelphia Inquirer. It's been a rough start to the season for the Phillies, whose 9-12 record puts them 6.5 games out of first place in the NL East. Roy Halladay hasn't been himself early (though he's shown signs of life), Ryan Howard hasn't hit much and they were already at a disadvantage with Carlos Ruiz serving a suspension to open the season. Offseason signee Mike Adams' two-year, $12MM contract was just one among a flurry of moves made by GM Ruben Amaro Jr. The Phillies traded for Michael Young and Ben Revere, signed Adams, John Lannan and Delmon Young as free agents and exercised the option on Ruiz's contract. While other members of the team have struggled, Adams has done little to suggest that he'll do anything other than what he's done for the past five seasons: dominate. Adams has allowed two runs in nine innings of work to go along with a sizzling 14-to-2 K/BB ratio. That meshes with the 1.98 ERA, 9.5 K/9 and 2.5 BB/9 he's posted in 295 innings since 2008. Teams are always on the lookout for bullpen help come the trade deadline, and this July figures to be no different. We've already seen Jason Motte hit the shelf with Tommy John surgery looking likely. Joel Hanrahan is on the disabled list. John Axford is out as the Brewers' closer. Relief pitching is volatile, and consistently dominant arms like Adams are tough to come by. If the Phillies are farther out of the race in two months, Amaro will have no shortage of phone calls regarding his ace setup man. Because he's under control for 2014 with an option for 2015, Adams would have significant trade value — more than the value he had in 2011 when the Rangers gave the Padres their No. 4 prospect (per Baseball America) in Robbie Erlin and their No. 22 prospect in Joe Wieland. That trade looks pretty good for the Padres right now, and the Phillies could benefit even more. Last summer, the Cardinals flipped a 2010 first-round pick in Zack Cox to acquire a year and a half of Edward Mujica — an inferior reliever to Adams. Granted, Cox's stock had dropped since entering the season as BA's No. 88 prospect, but it can serve as a point of reference in talks for Adams. Two and a half years of Adams at a reasonable price should be enough for a team to part with a Top 100 prospect and another respectable piece. The Phillies haven't made a history of being sellers at the deadline, but they traded Hunter Pence and Shane Victorino last July and will likely be faced with the opportunity to add prospects via trade once again. Adams should draw plenty of interest, though Amaro may also choose to keep him around with the hope that he can contribute to the next Phillies contender. Trade deadlines come and go every year, and in looking back we tend to remember the blockbuster deals. Few will forget last year's Hanley Ramirez deal or 2011's Ubaldo Jimenez trade (even if both teams involved would probably like to). Sometimes though, the smaller deals wind up yielding plentiful returns as well. Mike Adams: The Padres initially landed Adams from the Indians in exchange for Brian Sikorski — a right-hander who threw 19 2/3 innings for Cleveland in a fourth-place season (whoops). Adams broke out in San Diego, posting a 1.66 ERA, 10.0 K/9 and 2.4 BB/9 in 217 innings over parts of four seasons. It was more of the same in Texas following the swap, as Adams totaled 78 innings of 2.88 ERA, 8.1 K/9 and 2.5 BB/9 for the Rangers. Adams was controlled through 2012 at just $2.54MM, so GM Jon Daniels was able to secure a dominant relief arm for a year and a half. He proved to be a bullpen workhorse in the postseason, appearing in 11 of the Rangers' 17 games with a 3.24 ERA. Adams hit the open market this offseason, and not surprisingly he wasn't issued a qualifying offer. He signed a two-year, $12MM with the Phillies, ending his time in the Lone Star state. 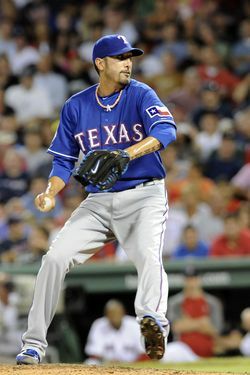 Joe Wieland: A fourth-round pick in the 2008 draft, Wieland ranked as the Rangers' No. 22 prospect prior to the 2011 season, per Baseball America. His stock has soared since that ranking. Wieland reached the big leagues last year and ranks as the No. 8 prospect in San Diego according to BA and No. 7 per MLB.com's Jonathan Mayo. Wieland's minor league numbers are impressive: a 3.29 ERA, 8.4 K/9 and 1.6 BB/9 in 438 innings. His 2012 season was cut short by Tommy John surgery, but Wieland posted a 4.55 ERA, 7.8 K/9 and 2.9 BB/9 in five starts. BA praises Wieland's plus command and four solid pitches. He sits 90-91 mph with his fastball and can run it up to 94 when needed. Mayo notes that all four of Wieland's pitches should be average or better, and both outlets agree that he's a mid-rotation starter if he realizes his potential. His surgery took place last July, so he should pitch again sometime in 2013. Robbie Erlin: Erlin was the bigger prospect at the time of the trade, but BA and Mayo both agree that Wieland has leapfrogged him. BA has him 10th among Padres prospects while Mayo ranks him ninth. Erlin missed about three months of the 2012 season with elbow tendinitis, but was dominant in the 52 1/3 innings he did pitch at Double-A; the 2009 third-rounder posted a 2.92 ERA, 12.4 K/9 and 2.4 BB/9. Erlin was impressive in the Arizona Fall League following his injury, finishing second the league with 31 strikeouts in 24 innings. He's undersized (5'11", 190 pounds) and lacks overpowering stuff, with BA noting that his fastball tops out at 92 mph. Mayo commends Erlin's approach of attacking hitters, adding that his pitchability and competitive nature allow his average offerings to play up. Erlin profiles as a No. 4 starter who will benefit from Petco Park, according to BA, and Mayo feels that he's on the brink of the big leagues. Adams proved to be a durable, highly effective late-inning arm for the Rangers, while the Padres have attained a pair of mid-rotation arms if Erlin and Wieland can overcome their respective arm injuries. Wieland's improvements have helped to make this look like a very strong return for San Diego. Time will tell if Wieland and/or Erlin can stick as big league starters, but I'd have to imagine that San Diego would be thrilled with the trade if even one of the two could be a part of the rotation for the next few years. Baseball America's 2013 Prospect Handbook was used in the creation of this post. Photo courtesy of USA Today Sports Images. Carlos Beltran told Mike Puma of the New York Post that David Wright should be able to handle the pressure that comes with a nine-figure contract. "He’s been with the organization a long time, so there is nothing he needs to change,” said Beltran, who signed a seven-year $119MM deal with the Mets as a free agent following the 2004 season. Marlins owner Jeffrey Loria said newcomer Adeiny Hechavarria has Hanley Ramirez’s endorsement, Clark Spencer of the Miami Herald reports. “When Hanley tells you ‘He is better than I am, you’ve got a great guy with great hands,’ it’s amusing to listen to,” Loria said. The Marlins, who traded Ramirez to Los Angeles last summer, acquired Hechavarria from Toronto in a blockbuster deal with the Blue Jays in November. Reliever Mike Adams would likely be with a different team had the Phillies completed their deal with the Astros for Wilton Lopez, reports Jim Salisbury of CSNPhilly.com. GM Ruben Amaro Jr. acknowledged that the Phillies "probably would not have" signed Adams had the club not pulled back from trading for Lopez (since dealt to the Rockies) for undisclosed reasons following his physical. The Phillies have officially signed veteran reliever Mike Adams, the team announced. It's a two-year contract worth $12MM with a third year club/vesting option worth $6.5MM. The option vests if he appears in 120 games from 2013-2014 with at least 60 appearances in 2014. The right-hander is represented by Josh Yates at ACES. Adams, 34, has been one of the game's very best setup men in recent years. 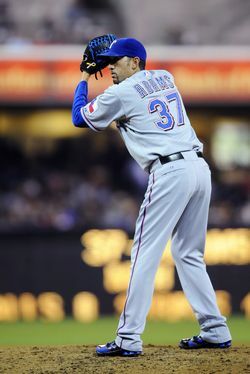 He pitched to a 3.27 ERA with 7.7 K/9 and 2.9 BB/9 in 52 1/3 innings for the Rangers this year, his lone full season in Texas after being acquired from the Padres for two pitching prospects at the 2011 trade deadline. Adams owns a 2.28 ERA with 9.0 K/9 and 2.6 BB/9 in his eight-year career. Philadelphia has been seeking bullpen help in front of Jonathan Papelbon this offseason, though they used right-hander Josh Lindblom to acquire Michael Young a few weeks ago. The team was also looking for a low-risk starter after using Vance Worley to acquire Ben Revere, and they have since agreed to sign John Lannan. More outfield help figures to be on the agenda as well. Adams is returning from October surgery to correct Thoracic Outlet Syndrome, a procedure that involved removing a rib. He is expected to be ready in time for Opening Day. Adams also dealt with numerous shoulder problems earlier in his career, including surgery on his labrum and rotator cuff back in 2008. As our Free Agent Tracker shows, he is the ninth reliever to receive a multiyear contract this offseason. MLBTR's Tim Dierkes ranked Adams as the 42nd best free agent available in his Top 50 Free Agents List, correctly predicting he would sign with the Phillies. If you signed up for our Free Agent Prediction Contest, check out where you stand with our leaderboard. Tim Brown of Yahoo! Sports first reported the two sides were nearing a deal while Tyler Garrett of KRISTV first reported the agreement. ESPN's Jayson Stark and FOX Sports' Ken Rosenthal added details along with Brown (Twitter links). Photo courtesy of USA Sports Images. The Phillies are close to signing Mike Adams to a two-year contract with a vesting option for 2015, reports Tim Brown of Yahoo! Sports. The team expects the deal to be finalized as soon as today. Adams, 34, pitched to a 3.27 ERA with 7.7 K/9 and 2.9 BB/9 in 52 1/3 relief innings for the Rangers last season as Joe Nathan's primary setup man. He had offseason surgery for Thoracic Outlet Syndrome and is expected to be ready in time for Opening Day. Adams is represented by Josh Yates at ACES. This post was originally published on October 15th. Happy birthday to Cubs great Fergie Jenkins, who was born 70 years ago today in Chatham, Ontario. The 1971 NL Cy Young Award winner won 167 games in 10 years with the Cubs and wore the red 'C' into the Hall of Fame when he was inducted in 1991. The Braves don't have any interest in trading for Cubs outfielder Alfonso Soriano, tweets David O'Brien of the Atlanta Journal-Constitution. The Cubs are willing to pay $26MM of Soriano's remaining $36MM salary in a trade and have shopped the veteran to the Astros and Phillies this offseason. The White Sox would like to bring back A.J. Pierzynski but only at the team's price, writes Dan Hayes of CSN Chicago. While the team has kept in touch with Pierzynski's agent, the Sox are prepared to go ahead with Tyler Flowers as their everyday catcher. The Brewers can probably be counted out of the Mike Adams hunt, opines Tom Haudricourt of the Milwaukee Journal Sentinel (Twitter link) as the free agent reliever will likely be priced out of the Crew's range. At least seven other teams besides Milwaukee are known to be interested in Adams. Also from Haudricourt, he outlines how the Brewers have been historically unable to keep their major stars, a trend that may continue given the team's small local TV contract. The one exception was Ryan Braun, who was already on an eight-year contract when he signed his major extension with the Crew. Reds GM Walt Jocketty told reporters (including John Fay of the Cincinnati Enquirer) that his team is pretty much done its winter shopping, though he hinted that the Reds could add a left-handed reliever. As the cost of high-end pitching has risen, Adam Wainwright is in position to receive a huge payday as he enters the final year of his contract with the Cardinals, writes the Associated Press. Both Wainwright and the Cards are open to the idea of discussing a new contract before Opening Day. From earlier today, the Cubs and Tigers are the final two suitors for Anibal Sanchez. The Cubs thought they had Sanchez signed to a five-year, $75MM offer, but Sanchez is giving the Tigers a final chance to match or top the offer.